Who says you should put your love for travelling on hold once you have a baby? With the right gear, travelling with a baby is not as daunting as it sounds. One item we would recommend getting is a travel crib. This is because your baby will still need the necessary confinement provided by a crib to keep him from rolling off as it may be the case if s/he sleeps on your bed. Yes, hotels generally do provide baby cribs if you request for them but most parents would prefer to have their baby sleep in one that they can be absolutely certain of in terms of its sturdiness and more importantly, hygiene quality. So yes, you can manage without a travel crib but if you are able to afford it, we definitely encourage getting one as we think it's worth the extra money expensed. Read on if you want to find out what is the best travel crib for baby we would recommend. 2. Do you need a travel crib? ​4. 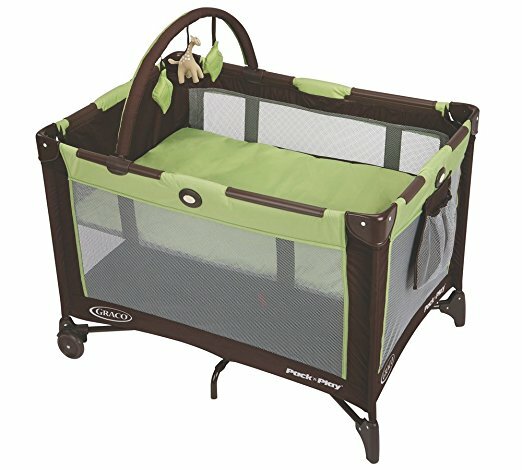 What to look for in a travel crib? The Lotus Travel Crib and BabyBjorn Travel Crib Light are the two top rated travel cribs in the market that often creates a dilemma to parents. After having tried and tested both, we can say the best baby crib depends on what you're using it primarily for. At 11 pounds, the Lotus is 2 pounds lighter than the B﻿﻿abyBjo﻿﻿rn which makes it the best lightweight travel crib for those who need to go abroad frequently because we all know when it comes to travelling, each pound makes all the difference. It is easy to pack in that it folds up neatly into a carry-on sized backpack that you can bring with you on plane without checking it in (can be carried like a briefcase too). This is something the Baby Bjorn cannot offer because it will not fit as a carry on and unless you are lucky to get it gate check free, you may need to pay a fee otherwise. 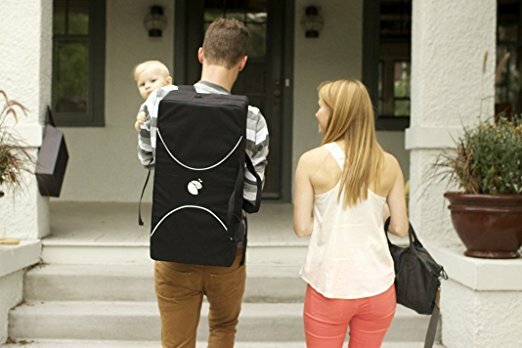 The other reason we think the Lotus is the best portable crib for travel because in backpack form, you can have both your hands free to carry your baby or manage other stuffs. This convenience will be felt especially when there will be frequent sleepovers at grandparents' house as you will need to carry other baby stuffs such as diapers or bottle warmers. Usability and convenience wise, we like how the Lotus has a thoughtful side-zip design which we think, is its biggest winning point over other travel cribs. Mattresses for travel cribs are usually placed a long way down so a side zip opening will allow you to easily lay your sleeping baby down without risking waking her up (sensitive babies will surely wake up if put all the way down from the top). Not only that, it makes it easier for you (especially if you are on the petite side) or grandparents to do so because you do not need to lean all the way in to lay baby down or lift him up. You will appreciate this feature even more if you nurse your baby to sleep because it allows you to lay down with your baby and later slip out gently when baby falls asleep. ​More often than not, parents will want to use the travel crib as a play space for baby as well and in this regard, we like the Lotus slightly better over the BabyBjorn because it has a wider opening at the top which makes it less claustrophobic. Of course, the BabyBjorn works perfectly fine as a play space so this may be just a slight preference of ours to note. Parents may find that the mattress of this travel crib is on the thin side but there is actually a reason for this. The federal standard for this product specifically limits the thickness to 1 inch because having a padding thicker than that may allow a gap to open between the mesh sides and this could potentially cause an entrapment hazard. We think the mattress provided is comfortable enough for babies to sleep through the night as high quality padding is used in the mattress, or you can always get an extra plush quilted sheet produced by the same company (Guava) for extra softness when your child turns 1 (as advised by the American Academy of Pediatrics Safe Sleep). ​To summarize, the Lotus Travel Crib is the best travel crib for flying, best portable bed and best play yard and it is cheaper than the BabyBjorn which has very comparable features. ​In our opinion, we think the BabyBjorn Travel Crib Light makes for the best travel baby bed if your baby will be doing a lot of sleeping in the crib because its mattress is thicker and more plush compared to the Lotus. When it comes to the BabyBjorn Travel Crib, we must mention its high quality. User have long raved about the plushness of the fabric used which are soft to touch and is tested and approved in accordance with the Oeko-Tex Standard 100, which is class 1 for baby products. This is a big assurance that the fabrics are free from harmful and allergenic substances to the extent that it is even safe for baby to chew on! The fitted sheet of the mattress is made of super soft, organic cotton that guarantees will not trigger allergies and it is tailored to fit and stay in place. We will say the biggest difference of this travel crib compare to the Lotus is its mattress. There is a built-in base plate in this mattress which keeps this lightweight crib standing strong and sturdy. The mattress is almost double the thickness of the Lotus' and is firmer, which is actually a pro rather than a con (click here to see why). Now, you may question if a thicker mattress will create the safety hazards mentioned in our Lotus Travel Crib review above and yes, we have thought of that as well. We can say that the risk of entrapment hazard is very low, if not nonexistent, and this is all due to the mattress securing mechanism of its design. The mattress pad is anchored with a hook-loop which you secured by pulling the red tabs through the corner slots of the crib. Not only is this easier and faster to do compared to the Lotus (which employs a velcro fastening that admittedly, may require some fumbling around), it also creates a perfect fit into the frame of the crib. And added to the fact that the crib does not open up at the side, its mattress is even more budge-proof thus eliminating any risk of entrapment. Because of its arguably more comfortable mattress, the BabyBjorn is regarded as one of the best portable bed for babies or best crib for grandmas' house. It is very easy to set and fold up that even grandparents will not have trouble manoeuvring. We like that it takes up lesser floor space in that its legs do not stick out as far as the Lotus' which makes it ideal for smaller rooms. The high quality, thicker mattress and ease of set up and use of this travel crib are definitely BabyBjorn's biggest selling points as the best travel bed for baby. You will note that the following reviewed products are all from Graco but we would like to clarify that we are not sponsored by them. All our reviews are based on our own research and multiple testings so that we can give you our honest opinion and recommendation. We have to say though, Graco does have an extensive line of travel cribs/playards and they do produced some amazing baby products (especially ﻿﻿﻿their﻿﻿﻿ strollers - read our review here ) which is a feat to be expected from a reputable company of more than 60 years. Both Lotus and BabyB﻿﻿﻿﻿﻿jorn lacks one attribute - they do not come with a bassinet. Sure, babies will eventually grow out of it but some parents would still like one so that they can use it as early as the newborn stage. If you are one of them and is looking for the best travel cot with bassinet, we recommend the Graco Pack 'n Play On T﻿﻿he Go Playard. One of the main reason that many parents choose to forego a travel crib with bassinet is that they think it is cumbersome to separately carry the bassinet. This is because most carry bags that come with the crib do not fit attachments as such. 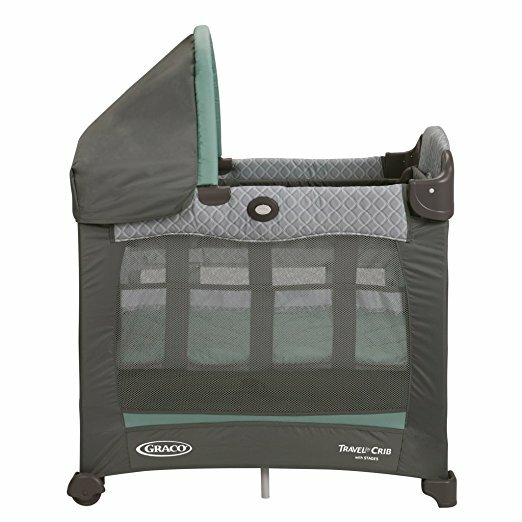 The Graco Pack 'n Play On the Go Playard addresses this issue by having a foldable bassinet design in that you do not have to detach the bassinet at all - simply fold it in with your playard and put it into the carrying bag that comes with it. Everything is in one portable package without any attachment parts so it is easy to carry around wherever you go! One thing we love about Graco is that it features folding feet and wheels to its playards which allow for a 20% more compact fold so that it is easy to store and carry. Despite this, it still opens up to a standard full size bassinet for your baby to rest and sleep. Closing/folding this playard is easy and fuss free with Graco's signature push-button fold and this is one feature that parents raved about so highly. Graco Pack 'N Play On the Go Playard is really the best playpen bassinet combo because not only is its bassinet super sturdy and comfortable, it also comes with a toy bar with soft toys to amuse your little one. Once your baby outgrows the bassinet, you can remove it and make the Pack 'N Play a playard for your toddler. Many have no problem using it as a full time crib for toddlers as it comes with a firm, padded mattress that toddlers can nap on. 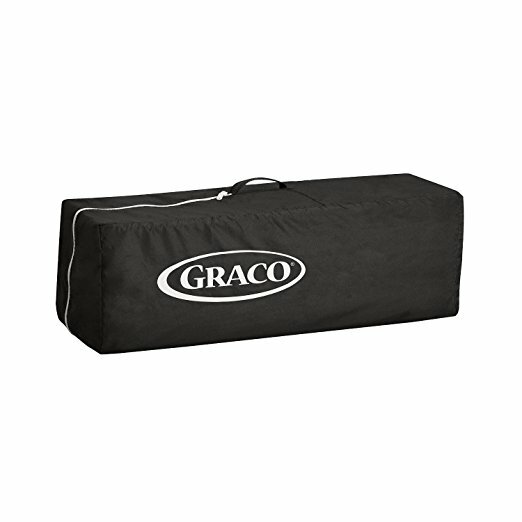 If you are looking for a travel crib that comes with a bassinet, give the Graco Pack 'N Play On The Go a go (no pun intended!) . It is very easy to set up and take down and is reasonably priced. There is a reason why it is the best pack and play for travel/ America's best-selling playard. 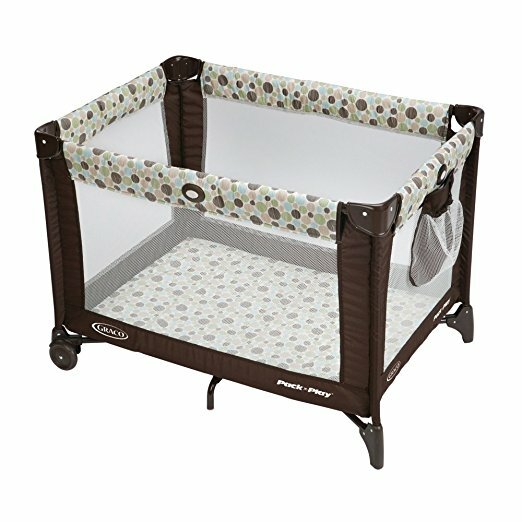 If you are looking for just a very basic and cheap ﻿travel crib without any features or attachments, the Graco Pack 'n Play Playard is your answer. Although it is not as light as the Lotus and BabyBjorn, this playard is still light enough to stand up to whatever travel plans you have. 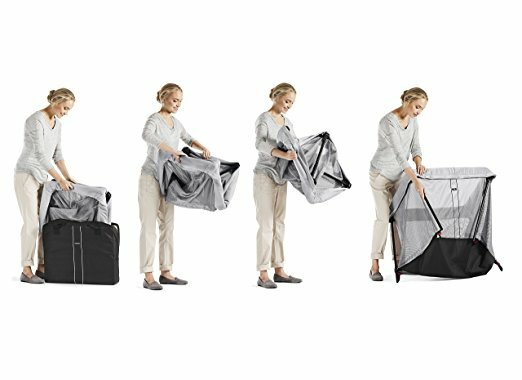 It folds up easily into a compact, small bundle thanks to Graco's signature push-button fold (with automatic folding feet and wheels) which you can then stow away in the carrying bag that comes with it. It is very durable as it is built with low centre of gravity. The legs are very stable and low to the ground so you do not have to worry about it tipping or rocking when all the child's weight is put to one side. 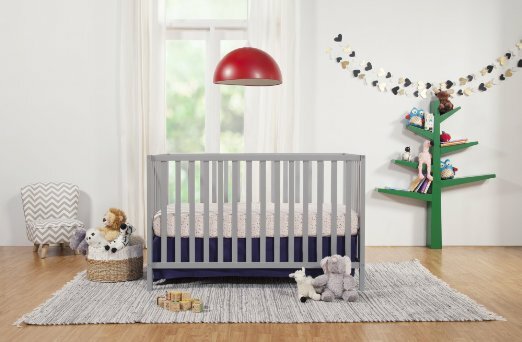 This playard is best if your primary use is to have a safe place for your little one to play or take a quick nap near you when you're attending to some quick house works. We wouldn't say it is the best travel bed for baby mainly because the 'mattress' that comes with it is not very cushioned. If you intend to use it for overnight sleeps, we recommend buying a separate mattress pad for it and this is a perfect fit. 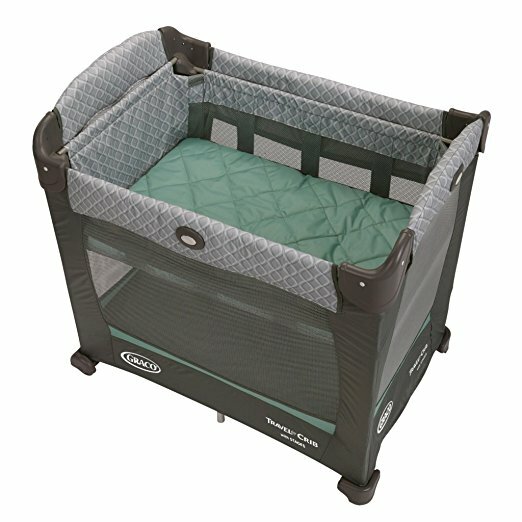 Not only is it one cheap portable crib, the Graco Pack 'n Play is also one of the best travel playard that is light, fuss-free and durable. Many parents choose this to store permanently at the grandparents' place because it is so compact which is why it is also dubbed the 'best portable crib for grandma's house'. With so many baby gears at home, they can take up a lot of space. It makes sense that sometimes, you do need a baby crib that can fit easily anywhere in your home so that you can do your house chores and keep an eye on baby instead of just staying in the nursery all day long. Or you may need a crib that is small and light to take along when you are travelling or paying a visit to grandparents. 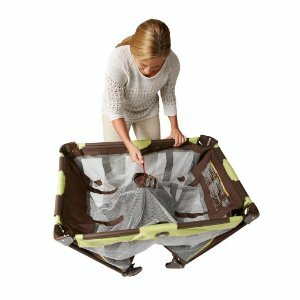 There are not many travel cribs that are of a smaller size and we admit it took us awhile to find one, but we can safely say that the Graco Travel Lite Portable Crib with Stages is the best mini travel crib. 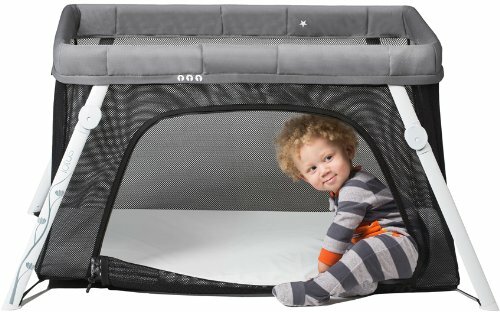 This mini travel crib has a unique space-saving design that makes it 20% smaller than traditional playards and it weighs less than 20 pounds. This, together with the inbuilt wheels makes it easy to move around your house or for travelling abroad. 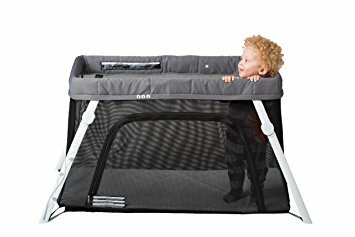 It also has a compact fold like the Pack 'N Play On The Go Playard so setting up and taking it down is a breeze with its signature push-button feature. Aside from its smaller size, we also like how it comes with a height-adjustable bassinet. 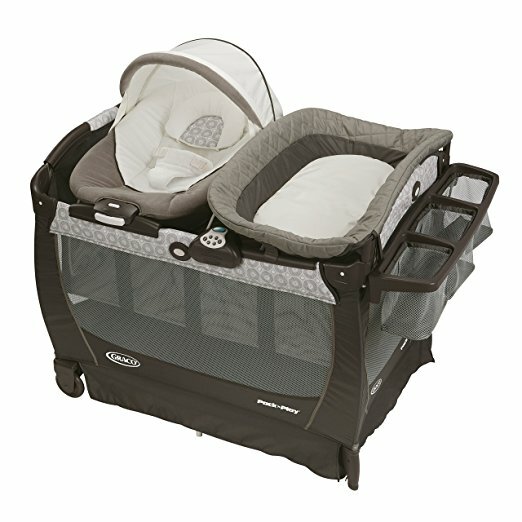 Yes, you read correctly - this pack and play has a one-of-a-kind 2-level adjustable bassinet that grows with your baby. This means you can use it no matter what 'stage' your baby is, and once the bassinet is outgrown of, you can remove it and convert the crib to a full-time portable playard. 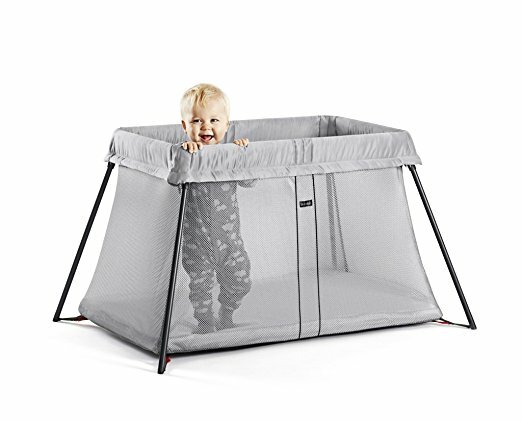 Even though it is small, it is big enough to keep your little one comfortable and it even comes with a canopy with toy bar to keep baby amused. Do adhere to the weight limit provided at the manual to ensure you adjust the bassinet accordingly to keep your baby safe and sound. With unique features like adjustable bassinet and compact size, the Graco Travel Lite Crib with Stages is really a one-of-a-kind product that caters to specific needs of parents. We think it is one of the best travel cot for newborn. While many parents will have a full sized ﻿﻿baby crib ﻿﻿in their home, it is common that they would require a more portable unit so that they can keep baby close when they are working on other house chores. Some popular items to achieve this include the baby swing/cradle and baby jumper but they both have certain limitations in that the former is limited to infants only while the latter does not cater to sleeping babies. The travel crib is a solution to this because with travel cots like this, it can grow with your baby from infant to toddler, from sleeping to active. And they are mostly easy to set up and close down, not to mention light and compact to bring with you on your travels. Even if you do not plan to travel often with your baby, a travel crib is perfectly handy for days such as an outing to the beach or when you go camping. 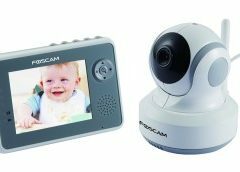 It is a favourite of parents for the occasional sleepovers at grandparents' house or simply just keeping an eye on your baby while you work outside the nursery. If any of the above applies to you, then yes, we do think you need a travel crib. It will make your life so much easier and convenient, we promise! ​There are basically two types of travel cribs - basic and full feature. 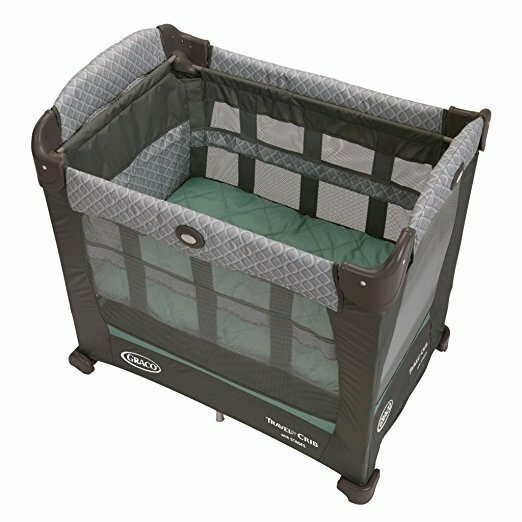 Basic - This type of travel crib is minimalist in that it has no add-ons/attachments whatsoever. 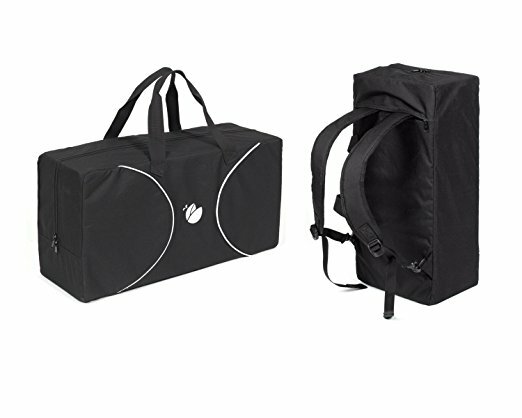 ​It is designed to be light and easy to pack for travelling purposes. Lighter materials and simple structural design are employed to achieve this purpose so while it may not be as sturdy as the full feature ones, babies' safety are guaranteed as it has a lower height to that the bottom almost sits on the floor. 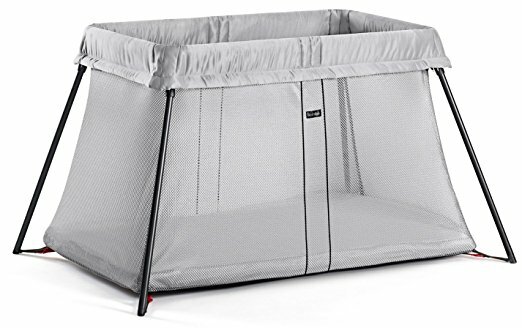 Full Feature - This type of travel crib has additional features such as bassinets or changing pads, or both like this one he﻿﻿﻿re, attached to the main unit. Its versatility means it is slightly bigger and heavier than the basic ones so some may think it is not as travel-friendly as the latter, but the good thing is you can use it at any stages of your baby since infant. It also has a slightly elevated bottom. You will notice that words like 'pack n play', 'playard' or 'play yard' were used interchangeably in our travel crib reviews above. What are the differences? A playard or play yard is a safe and enclosed space that babies can play and sleep in. It is lightweight and portable to be moved around hence it is also known as a 'travel crib'. 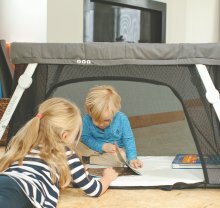 Older generations may be more familiar with it being called a 'playpen', while younger parents often refer it as 'pack and plays' due to the huge popularity of Graco's Pack 'N Play. Regardless of the many different names, they are essentially all the same - a confined, portable space for babies to play and sleep in, so don't get confused! We recommend choosing a product that uses materials free of chemicals and flame-retardants. From our research, the only travel cribs that do not contain flame retardants are the Nuna Sena, BabyBjorn Travel Crib Light and Guava﻿﻿﻿﻿﻿﻿﻿ Lotus Travel Crib and Portable Baby Playard. 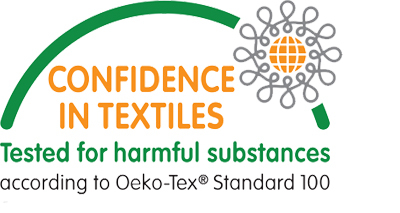 The former two are Oeko-Tex certified which is the highest non-toxic certification you can get, but Guava's Lotus is also Green Guard Gold Certified (we are told that they are looking into Oeko-Tex certification soon). ​This is a no brainer - babies tend to get messy so make sure you find one that has detachable covers and removable mattress sheets so that you can put it into the wash frequently to ensure optimum hygiene. The BabyBjorn and Lotus are excellent examples of this. As mentioned in the beginning of this review, consider what is the primary use you will be needing from a travel crib. Go for the minimalist ones if you will be doing a lot of travelling with it, or buy one with a bassinet feature if you intend it to be more of a permanent fixture in the grandparents' house. Whichever it is, rest assured that most travel cribs can be folded compactly to store away when it's not needed.